It’s time to revisit Ma’s old chest in the attic, dig out these forgotten recipes, and share them with the world! 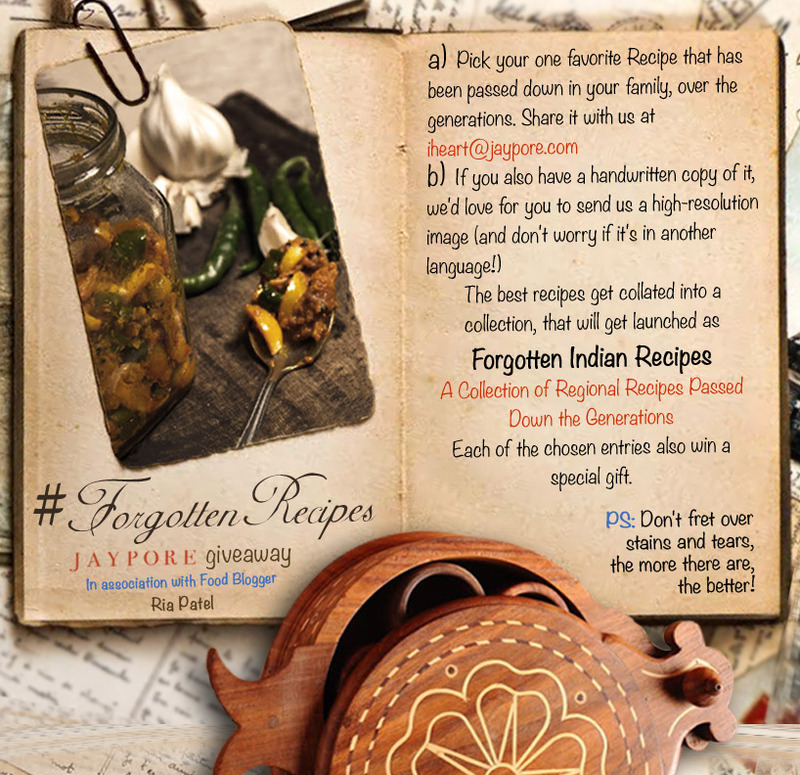 The best recipes get collated into a collection, that will get launched as ‘Forgotten Indian Recipes: A Collection of Regional Recipes Passed Down the Generations’. Each of the chosen entries also win a special gift. PS: Don’t fret over stains and tears, the more there are, the better! This campaign is in association with Food Blogger, Ria Patel. Posted in Contest, Food, Incredible India, India, inspiration, Jaypore, On A Platter and tagged #MyKitchenDiaries, campaign, Contest, delicious, edible, faily, favorite, Food, forgotten, ForgottenRecipes, generations, giveaway, India, Indian, Jaypore, participate, recipes, regional, share, tasty, yummy. Bookmark the permalink. What is the last date of submission of recipes. Hi Neha, this contest closes on 20th September.